The courage to take the huge decision to globally recall its Galaxy Note 7 smartphone, and the speed at which Samsung moved, has drawn plaudits from PR experts. 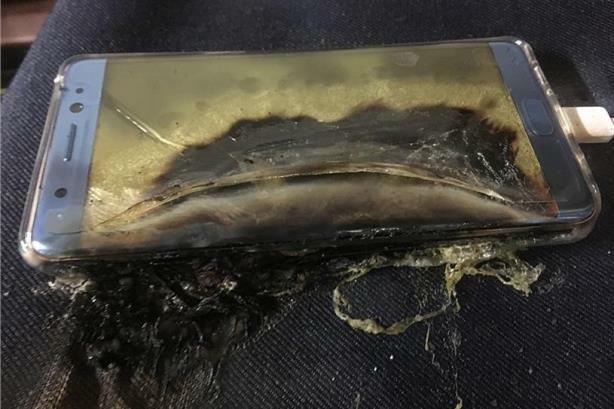 A fried Samsung Galaxy Note 7, which prompted the recall (source: YouTube). Samsung’s global recall of its flagship and hugely anticipated Galaxy Note 7 smartphone has sent shockwaves across the technology industry, but leading PR experts have said the brand has handled the crisis almost perfectly so far. "They were bold and got ahead of the problem in almost real-time," said Charles Lankester, senior vice president for reputation management at Ruder Finn Asia. "They were brilliant in that they chose to take a massive step and recall globally." "They could have attempted small-scale ‘market here, market there’ damage control, but this would have failed. Instead they went global. Because, as well as being the right thing to do, it’s 2016. Everyone sees, hears, knows and shares pretty much everything about all global brands." Although only 35 Note 7 phones worldwide were reported as having faulty lithium batteries that in some cases caught fire, Samsung’s monumental decision to recall all of them indicates the brand’s awareness of the seriousness of the problem and how quickly it needed to be addressed. Marc Sparrow, executive director for technology at Golin Hong Kong, said: "They have taken a necessary decision to put their customers first, be fully transparent and initiate a swift resolution. Quickly alleviating fears or doubts and reassuring customers will be imperative to moving past this unfortunate incident and maintaining the company's impressive sales." However, Samsung won't escape unscathed. Observers agree that there will be significant commercial repercussions, especially given the timing of the crisis, on the eve of the global IFA consumer electronics fair, putting Samsung firmly in the spotlight. But the decision to recall was the correct one from a brand reputation perspective, said Lars Voedisch (pictured), founder and managing director of PRecious Communications in Singapore. "Getting it right in this instance was to stop sales and then initiate a recall," he told Campaign Asia-Pacific. "This is a big move and the only one that makes sense in such a situation. You could argue whether the US$25 credits for people who bought the device are sufficient, but at least they did something." While Samsung’s statement on the matter drew some criticism for being rather anodyne, the crucial aspect of the company’s response has been its transparency, experts say. Samsung’s latest updated release, issued in Hong Kong yesterday, for example, includes data that following "a thorough investigation", fewer than "500 units of Galaxy Note 7 sold in Hong Kong and Macau between 26 August and 1 September may be affected". Additional information includes details on how consumers can return their devices, and yet another apology aimed at reassuring consumers over product safety. "Please be assured that your safety and confidence in Samsung products are our highest priority, and we sincerely apologise for this issue," the company said. "We are committed to do everything necessary to ensure that you are completely satisfied with your purchase." "It appears investor loyalty remains," Sparrow said. "Eyes will now be on the corporate reputation and how consumers perceive Samsung." Lankester added that while it’s true that the cost to Samsung would be significant, "the bigger picture is that Samsung’s behaviour will be respected, understood and admired."